Something insidious infects our children from the moment they’re born. It’s unstoppable. It surrounds us, burrows in deep, far below our conscious minds, and like a computer virus, writes subtle programming that dictates our worldview, our attitudes, and assumptions, shaping our very reflexes… Ahem. Shifting away from threatening apocalyptic movie-trailer voice, I’m speaking, of course, about culture and tradition, terms I’ll use interchangeably here. These are not bad per se, surely every culture has positive as well as negative aspects. Rather, it is the strength of culture in shaping our unconscious mind and worldview that poses potential problems; we tend to be blind to our own assumptions and cultural inheritance, and it affects us on many levels. is everyone playing a variant of the actual rules without actually realising it? Well [one] answer here is that no-one ever actually reads the rules of Monopoly. Monopoly is something you learn through word-of-mouth in childhood, like riding a bike or tying your shoelaces. Your mother, who never read the rules but was instead taught them by her father, taught you, and one day you will teach your children, again without reading the rules first. She passed on broken rules to you and you’ll pass them on to your kids. So the set of rules we play by is the shared cultural set of rules passed down through the generations, and not the ones written on the booklet inside the box. We all assume the Monopoly rules we play by are the written rules, but they don’t actually correspond entirely. The real-world consequence is, we all hate Monopoly. The inherited tradition telling us the rules can be so strong that even when we DO read them, we sometimes manage to ignore the absence of our tradition and read it in, largely unconsciously. One place this affects LDS is in our scripture reading and subsequent interpreting. We often go into our scriptures already knowing (or so we think) just what they say and what they mean, and then overlook or ignore anything to the contrary. Mormons are not alone in this, of course. Everyone inherits some kind of interpretive tradition. Evangelical scholar Peter Enns called this inherited interpretive tradition “the interpreted Bible,”and spends several pages discussing it in context of Paul’s 2nd Temple Judaism traditions regarding Adam. 2 He introduces the concept with the example of the insensitive innkeeper who turns away Joseph and a very pregnant Mary, who’s endured riding a donkey for miles. 3 We all know the mean innkeeper, and we’ve seen him in various LDS and non-LDS depictions of the birth narrative of Christ. However, he exists only in the “interpreted Bible”, the interpretation and retelling we’ve inherited culturally, but the mean innkeeper is not found in scripture. This kind of receiving-cultural-tradition-as-scripture can happen even at high levels in the Church. This kind of thing happens all the time, because so few of us have experience reading closely (that’s a semi-technical term) and because of that insidious power of tradition. Kirk commented about the Mormon Theology Seminar on Gen 2-3, “This is what I love so much about the MTS, it does what nobody else seems to want to do, read scripture.” Well, trying, anyway. Twice during the MTS, I wrote a paragraph, then decided to look at the relevant passages again. It turned out that both times, in spite of reading the text closely in English and Hebrew, my received tradition was overpowering what was right in front of my eyes. Go here, and look at my completely crossed-out paragraph. It was so disconcertingly easy for me to do. Exposure to different cultures and assumptions; it doesn’t matter who or where you are, you’re in some kind of bubble, so get out of whatever bubble you’re in. That’s not a Provo or a Utah jab. We ALL have traditions and limited perspectives. My wife has seen some amazingly narrow and provincial people in NYC, with little exposure to other places or ways of thought. Exposure helps make us aware of our own assumptions. One thing I tried to do when teaching Institute or at BYU was to expose students to new perspectives and challenge them a little, as well as encourage critical thinking. Read people you might disagree with, people from different perspectives, people who might not be approved! (That’s pretty much everybody.) LDS, non-LDS, Jewish, Catholic, Evangelical, left, right, independent, whatever. If you only read what you already know you like, the “safe” stuff, you’re participating in and contributing to the Balkanization of thought in this country, as well as cheating yourself a bit of the growth that comes from challenge. Learn to read closely. That is, pay close attention, ask questions, write a paraphrase, read a second translation, use good tools and appropriate dictionaries,6 keep detailed notes. I’ve got a 3-part series about this stuff. Part 1, part 2, part 3. Slow down. My Mom’s been teaching an adult Institute class for 3 years and they’re just now into Alma. I attended a Torah study class for about 18 months, and we covered about half of Deuteronomy. I once got permission to teach an Institute class just on the Small Plates of Nephi. We did not have a schedule; we just didn’t move on until there was nothing left for anyone to say about a passage. You’ll note, these are all the polar opposite of that Gospel Doctrine refrain “There’s so much to say, but we have to get through these chapters, so let’s move on.” To say nothing of trying to cover the entire Old Testament in a year. But again, those are institutional schedules. Personal reading and study can march to the beat of a different drummer. If you’re going slowly, you’re much more likely to notice discontinuities with your assumed reading. Stop assuming you know what the scriptures say or what they mean. “If we assume that we already know what the scriptures say, then they cannot continue to teach us.” This is partially an Institutional issue (see here for a good discussion) but something we can also do on an individual basis. Jim Faulconer offers some great suggestions here. Addendum: John Walton gets at this idea concisely in his NIV Application Commentary volume on Genesis, p. 318. Too often traditions can create presuppositions that in turn regulate the interpretive process. When we approach a text, we must be able to set our presuppositions off to the side as much as possible so that we do not impose them onto the text. It is not wrong to have presuppositions, but it is important to have a realistic grasp of what our presuppositions are so that we can assess their impact on our interpretation. Some of the traditions we carry as baggage are blind presuppositions—that is, we don’t even realize they come from tradition rather than text. Blind presuppositions are the worst kind because we think we have gotten them from [scripture] when in reality they lack that authority. We don’t even realize that they are imported into the text, and we must evaluate their relevance and truth rather than assume them to be accurate. Update: I mentioned this book in the comments, but it’s worth more PR than that. It’s a great volume for challenging our cultural assumptions that we bring to the scriptures. Misreading Scripture with Western Eyes: Removing Cultural Blinders to Better Understand the Bible addresses cultural and contextual issues and assumptions, in a variety of areas, such as wealth, race, language, shame/honor, individuality/collectivism, and others. I suspect these things apply to most of what we study or should study. They certainly apply to politics. I love the Monopoly analogy. Perfect. Does reading and exposure alone lead to a realization of the problem? What if someone were to specifically tell you, “your culture is contrary to the scriptures and here are the 20 scriptural passages explaining it…”?? Are people reasonable/logical/faithful enough to go contrary to popular culture (stop putting money in free parking) and play by the scriptural “rules” of life? Is it acceptable to simply say, “well, following those rules are implausible?” and just go on doing things our own way. I know it is no crime to do it in monopoly (no one is a “bad person” for not playing correctly), but what about doing it with life? JAX- Good questions. How do house rules apply when playing in someone else’s house? To the extent that reading makes you say, “oh, this thing I’d taken as a given, isn’t necessarily a given.” As to “contrary to the scriptures”, that’s often in the eye of the beholder, as filtered through culture. I highly recommend a good general volume introducing cultural and contextual issues, Misreading Scripture with Western Eyes: Removing Cultural Blinders to Better Understand the Bible. It doesn’t address Genesis directly, but covers a variety of provocative topics, such as wealth, race, language, shame/honor, individuality/collectivism, and others. Well done! Great mind opening concept clearly explained. Thanks for posting it. Great analogy Ben, seriously perfect (especially for a game rule nazi like myself). Someone once gave me the challenge of reading scripture pretending you’d never heard a thing about it, didn’t know what was coming next, had no interpretation to force upon it, and took only the spirit as your guide. I’ve started to wonder how much truth is right before my very eyes, but my tradition and unbelief and stubborness get in the way of understanding great knowledge that is written in plainness that I refuse to see. One last note. The title is fun, but helps illustrate that it’s not necessary to posit devious machinations to introduce misreadings or deviant ideas or harmful traditions. By nature of our own enculturation, we all contribute to this. 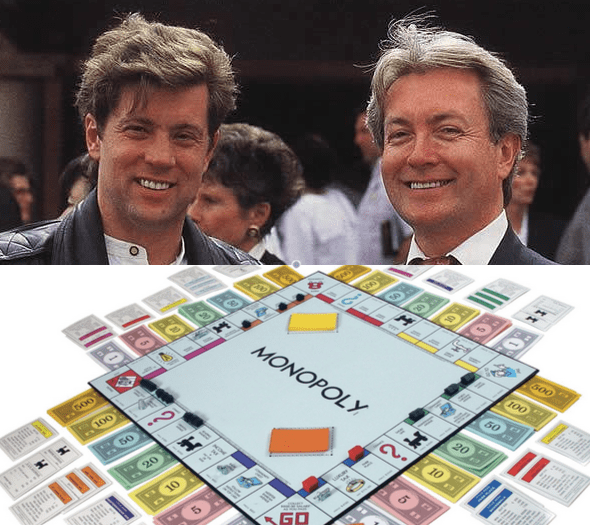 Following the analogy, “pure” Monopoly rules untouched by philosophies of men don’t exist, because the rules themselves are encultured, part of a cultural tradition. They scripture themselves are not free of the “philosophies of men” because they were written by encultured humans. I’ve written about prophetic enculturation here. So the whole idea is a bit problematic. Ben, helpful counsel indeed. It led me to consider the two-fold responsibility of reading scripture: understanding AND applying. It seems that I am as prone to transfer faulty readings as I am applications. While I chew on this a bit, allow me to thank you for taking the time to share. Is that really Michael Ballam? LOVE! I once attended a week long class at BYU’s Education Week about the efficacy of honesty and lying — and Ballam sat behind my the whole week. Every time I saw his face it made me giggle. I hope he didn’t notice. He’s probably used to it. Back when I taught institute classes (in the sense of Stake adult continuing education), I once spent two entire years on the BoM. Twice I taught a semester class on early LDS Church History, which was simply New York and an introduction to Ohio. I love your advice to slow down. I taught a year-long class on Psalms and a semester-long on the first half of Genesis . . .the best stuff ever. So I like this post. I have always found the insistence on underlining verses part of this problem. The correct meaning is given by the instructor and the class is urged to underline it, pretty much assuring that is what will be remembered each time the verse is reread. I’ve played Monopoly using the written rules, on and off for a long time. Just FYI. I have the four semester transcripts of the Nibley Book of Mormon class. Well worth reading. Also really enjoyed “Paul, the Jewish Theologian” which I read shortly after it was published and have reflected on a number of times. You tell stories to change culture. Understanding the context and historical background of the history can be as powerful as the story itself. Having the revealed word of God in mind as we study ancient scripture helps us understand the principles & doctrines implicated, but having some idea why instruments in a story or allegory were chosen by an ancient author are just as meaningful. Sometime we rely on the revealed Word to tell us, but I find many times that its through exterior efforts we find discovery. For example, knowing that the term “fool” in the old testament didn’t mean “village idiot” but was more in line with “son of perdition” makes the scriptures that have the word fool in them, significantly more powerful in ephasising the caliber of the message. When even our modern leaders use phrases like “getting the message to the end of the row” – it has little impact because largely (at least in the US) we are no longer an agrigarian population, and don’t appreciate the implications that not getting water to the end of the row of crops, causes them to be stunted, even whither and die. Knowing how that term relates to the rest of the message presented, does then have greater impact. I agree that slowing down can help. Personal revelation is a great asset. Taking time to learn more about the culture, practices, and situational conditions during the time the scripture was written, for me at least, is profoundly useful. How do house rules apply when playing in someone else’s house? Excellent question Ben! What about when someone is playing by a “house rule” that THEY think is a written rule (when someone thinks a scenarie is “doctrine” but it isn’t). Do you correct them? or continue to play? What rules do you let slide because it isn’t important enough to correct? And which rules are worth fighting over to correct? Sabbath activities, movie choices, music choices, dress/modesty, language, etc??? Do house rules apply? and does the Lord view all house rules as acceptable? What do you do when culture is making a conscious choice to change contrary to the “rules”/scripture? If we’re all fighting culture when reading what is “plain as word can be” (2 Nep 32:3), what about when the culture is actively trying to say “The rules are wrong!” Homosexuality for example. It is as plain as word can be in the Bible that it is immoral and that we should “turn away” from such. Do we accept the cultural pressure to play by their “house rules” or do we adhere to the written rules of the game??? It is complicated when the owners and distributers of the game play publically with the culturally perpetuated rules. 1. If you could get the Church Education System to embrace just one of your suggestions when it comes to studying the scriptures, it would be a minor miracle. Check that. A major miracle. 2. As to questions regarding the rules of games such as Monopoly, Jerry Seinfeld has offered the following divinely inspired guidance: “To me, a lawyer is basically the person that knows the rules of the country. We’re all throwing the dice, playing the game, moving our pieces around the board, but if there is a problem the lawyer is the only person who has read the inside of the top of the box.” There is no question in my mind that if Hugh Nibley were alive today, he would passionately echo this sentiment. “equating Monopoly with scripture though.” Well, I’m really not trying to do that, as much as use Monopoly to show how tradition can make us misread or ignore things, as with the JFieldingSmith story. Approaching scripture as a rulebook is a highly problematic concept and one I disagree with. Agreed Ben. Although I might go more in-depth and say that ‘rulebook’ would be only one of many aspects/roles of scripture. They do in fact contain express rules, commandments, ordinances, laws, etc. But I completely agree that seeing that as the sole role is probably unhealthy. Ben, wanted to tell you I think this is a great piece, one to which I can refer others for a very long time. When I’ve taught GD, I do have to follow the schedule, but I’ve found a way that works a little better and a little more like you suggest. I prepare the lesson with a deeper focus on only a few aspects. I don’t ever try to get through all the material. We’ll be back around in a few years anyway and they can pick up a different, important aspect the next time. I do have many serious reservations about equating Monopoly with scripture though. Its even tough to play by the rules when you are trying. I once started a big discussion about what it meant to advance your token to the nearest railroad. The common interpretation would be the first one you advance to, but if the physically nearest one is behind you, why wouldn’t you go past the others until you get to the one that was physically nearest. I wonder if it can be a measure of how well you adapt to others beliefs, how you adapt to different house rules of Monopoly? Two thoughts come to mind. One is about context, which has already been mentioned by a couple of posters. I think of President Kimball’s interpretation of Peter’s behavior on the night he betrayed the savior as a great example. Given that Jesus knew he was about to be martyred, perhaps it is true that he saw Peter as the leading apostle, and in order to save the church from extinction, asked Peter to betray him so that the guards would not associate them. Context means a great deal to fully understanding what might have happened here. Communication is problematic enough without resorting obfuscation to buy B&O Railroad before your opponent. Amazingly there was agreement on advance, it was whether nearest was established in the direction of advancing. Ummm, this is off-topic, but … who’s the other Devil Guy? Amen, couldn’t be better said. There is this stubborn idea that pervades much of LDS culture, perhaps emanating from the leadership as well, that people who read supposedly “anti-Mormon literature” (often something as benign as Jan Shipps or Michael Quinn) will be irredeemably sucked into a vortex of disbelief that will completely shake their foundations of “testimony.” Some of the most ardent supporters of the LDS church that I know are well-acquainted with the arguments or Fawn Brodie and company. Ken – If you’re meaning the picture of the two men who have played Lucifer in the Temple films, next to Michael Ballam is Darryl Yeager, who hasn’t done much acting (he was Alexander Hamilton in “A More Perfect Union”) but apperantly has done much more dance work (in the films “Staying Alive” and “Girls Just Wanna Have Fun”, and other, non-film areas). He’s currently the Artistic Director of Odessey Dance Theatre, in SLC. If you’ve meaning the devil-looking guy on the Monopoly board – that’s Jake the Jailbird. Thanks for the comments and participation, all. Based some comments here and elsewhere, it appears that I could have written this better, to downplay the idea of “rules” and emphasize this; we often assume our knowledge of a given principle is firmly based on scripture when in fact it’s largely based on a received-by-tradition interpretation of scripture. Citation, Eric? Is that from a recent devotional? Cameron, Ben already beat me to it (see directly above). It was at a leadership training conference held last year. Dan Peterson refers to the power of these cultural concepts to overcome actual knowledge by pointing to the assuption he had that the 8 witnesses of the Book of Mormon saw them displayed on a tree stump. It turned out that there is no historical source for that, it was just a feature of a painting of the event that many of us have seen. We know about the innkeeper who turned away mary because we have seen him in countless paintings and movies and Christmas pageants. A real world example of this tendency is the way government bureaucrats exercise their authority. They have traditions about the scope of their authority, but many of them don’t read the law, and when they do read it, they are looking only for justification for exercising power in they way they want to do it, rather than any constraint or lmitation on their own authority. as Joseph smith notes in D&C Section 121, the tendency of all men is to abuse authority, to take it beyond its legitimate scope. Unfortunately, I think that it is all too easy for us to read the scriptures in the same way when we are exercising authority over our families or our fellow saints. We just assume that anything that comes into our heads is based on the scriptures we know, the teachings we have heard over the pulpit, and on the inspiration of the Spirit. We don’t read the scriptures as limits on our authority over other people, as a basis to question our ideas or actions. The problem with proof texting and treating scriptures as regulations is that it imposes a single meaning on the scriptures, and that meaning is molded to a particular function we want it to serve, rather than being allowed to communicate what it actually says. Apart from the Ten Commandments and some other pronouncements, the scriptures are not statutes and regulations, but rather are extended conversations and narratives in which the meaning of each part can only be understood as part of the whole. Beyond the problems of transmission and translation, the imperfection of our own language is pointed out in the scriptures, but we don’t remember it when we are trying to understand a scripture. If Mormon and Moroni were sensitive about the limitations of their ability to express the understanding given them by God in their own language, how much more do we need to be careful about making too muich out of the specific language used in the English translation of their writings?